Beachside deck with sofas etc. Along the shores of Mihiripenna beach in beautiful Sri Lanka, Elysium Villa staying true to its name is a stunning holiday haven fit for the Gods. 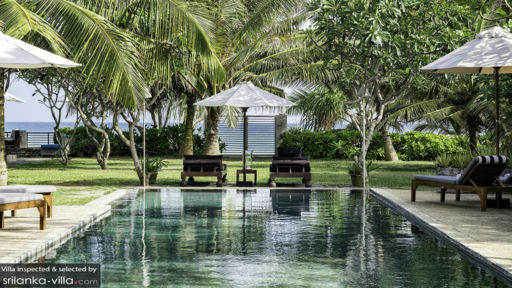 Living in the lap of luxury was never more appropriate than at this beachfront property which features neutral colours, rich tropical gardens, lavish interiors, and traditional Sri Lankan architecture. 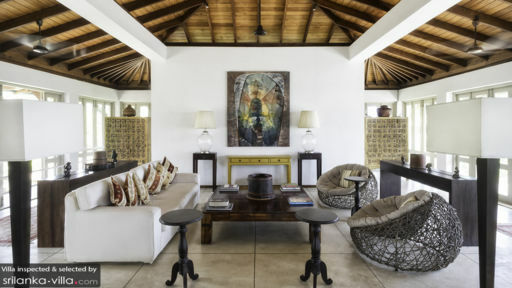 With slanted, wooden ceilings and plenty of open spaces for easy movement around the beach and pool, the villa is perfect for private events like parties and get-togethers with friends. The villa is closely situated to the city of Galle with its historical streets and a world of culture for you to explore. Elysium Villa spoils its guest limitlessly with five, splendidly furnished, bedrooms that not only provide luxurious living but also make for personal sanctuaries with their intimate, minimal décor, plush king-sized beds with quality linen, traditional ceilings, and elegant furnishings. There are window seats, armchairs, and dressers for guests’ use and one bedroom is, in fact, a family suite with an interconnected room that houses six bunk beds perfect for kids. Most of the bedrooms are the epitome of contemporary elegance, however, the family room is more about culture with weathered furniture, traditional artwork on the walls, and darker tones. Each bedroom is air-conditioned and is accompanied by an en-suite bathroom that is equal parts convenience and luxury. The beachfront location of Elysium Villa is truly a breathtaking sight as you can relax on the beachside lounge with plush sofas, and gates that lead directly to the sandy shores. A 20-metre swimming pool extending out in the ocean’s direction is perfect for a refreshing dip and swimming laps. There are numerous sun chairs with parasols on the deck, so you can sunbathe or doze off under the tropical sun. The villa allows you to enjoy the outdoors in the best way possible with several alfresco dining spots located around the pool and gardens. Elysium Villa is designed in resort style with a spacious layout that takes into account the ocean, verdure of the gardens, sandy beach, and the villa itself. There are plenty of living spaces furnished with comfortable sofas overlooking the gardens or the ocean all around the villa. Rattan chairs, daybeds, loungers, and sun chairs are a plenty at the villa. The expansive and luxurious living area is great for spending time with friends and family as it is furnished to offer the utmost comfort to guests. There are two living rooms with white couches, antique cabinets, designer chairs, and one with a traditional ceiling. The opulence in the rooms is evident from the moment you step indoors while gazing across the artwork that lines the wall to the carved armoires, and intriguing artefacts. The dining area is found on the patio with an ocean view so you can relish a splendid garden feast with loved ones. For your enjoyment, there is even a billiard table in one of the living rooms. There is a fully-equipped kitchen where a personal chef can prepare delicious meals for you upon request. Not only does the villa offer full services of experienced staff members such as housekeeping, security, maintenance etc., it even allows you the chance to make the most of your beautiful location by offering car rentals and in-house massages upon request. If you wish, you can opt to book the services of a personal chef as well. There is a private multi-purpose gym on the property, equipped with all sorts of machinery for your fitness needs! When you’re directly located on the beach, you have access to the crashing waves, sandy shores, and much more delightful sights than normal. Enjoy a day out and about the city of Galle with its age-old Dutch architecture and the Galle Fort. There are National Parks, museums, and galleries in the vicinity as well, ideal for those looking to learn something about Sri Lanka. Amazing holiday and fabulous villa. Staff were very helpful and good with the baby. Food was excellent. We stayed as a large group at the Elysium Villa near Galle. The Villa was beautiful, the staff very attentive, the food wonderful and the location was great. Although you can't swim on the beach directly in front of the villa if the waves are big there are areas to swim fairly close by and the beach is beautiful. Each of the villas rooms are in a cottage of their own set in a large garden. Everywhere is beautifully decorated with lots of great touches and places for lounging. The kids bunk room was a very cool place for the kids to hang out. We could not fault the villa or the organization of the villa agency and were certainly go again. I completed this villa in February 2006 and it is lovely to come back and see how it has matured…especially the gardens. Thank you for your hospitality and congratulations to you and your staff on the way the property is maintained and operated : really excellent. Lorraine and I thoroughly enjoyed every minute of it. You will live forever in our memories. The beautiful villa, the "champa" flowers, dinners at the master round table, incredible curries, the many laughs we had while playing in the pool, Chatura's incredible warmth and hospitality (my mother wanted to take him home ! ), Chamara's brilliant Sri Lankan smile... and then of course the intimate wedding on the beach. Elysium is in a word our definition of paradise. We do hope to come back again and again. Thank you for making our stay so wonderful.